The mother (Nancy Kelly) of a psychopathic child (Patty McCormack) is horrified to learn that her daughter feels no remorse about having killed her classmate. 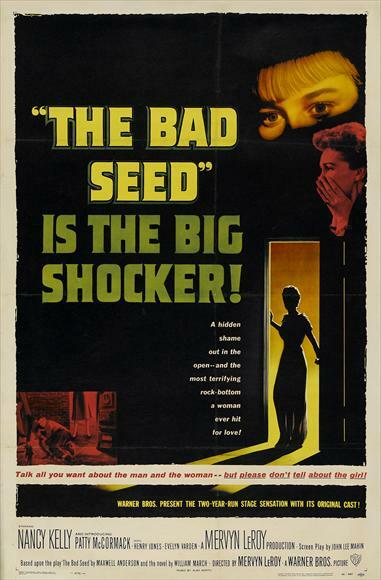 Although it’s undeniably campy and somewhat dated, The Bad Seed maintains its status as the most notorious movie ever made about “evil children”, and thus holds a special place in cinematic history. Moviegoers may be inured to watching cold-blooded murders committed by hardened criminals, but it’s something different altogether to contemplate them carried out blithely by a young girl (not a teen) in blonde pigtails and a pinafore — someone who is deeply loved by her family, and given every possible privilege. It is this disparity which remains the primary seduction of the controversial story (originally a novel, then a hit Broadway play), about the unpredictably hideous effects of heredity. When I first watched The Bad Seed years ago, I remember being deeply disturbed by the character of Rhoda, and unable to reconcile her spooky amorality with my rather idealized notion of childhood. Watching it again recently, however, I was primarily affected by the film’s true protagonist: not Rhoda, but her mother, a sympathetic character struggling to come to terms with what is essentially an impossible truth about her child. While many find Nancy Kelly’s performance to be campy and overblown, I was genuinely moved by her dilemma. It’s impossible to review The Bad Seed without briefly discussing Patty McCormack, who pioneered the title role on Broadway before immortalizing it in celluloid. While her performance is uneven — she uses too many broad facial expressions which are more appropriate for the stage than cinematic close-ups — she nonetheless has a strong presence on-screen, and shows far more talent than we’ve come to expect from most child actors. Her portrayal as Rhoda is not easily forgotten, and will most likely remain this character’s definitive incarnation. Yes. This camp classic should be seen at least once by all film fanatics. Absolutely a must – and betcha can’t watch just once! It’s true that, nowadays, ‘The Bad Seed’ is seen as camp, but it differs significantly from other camp ‘greats’ like ‘Mommie Dearest’, ‘Showgirls’, just about anything late in Joan Crawford’s career. This is because (as stated) mom has a very reeeal problem on her hands. Films that are 100% camp have no room for quality of that type. Though we may find ‘TBS’ funny at times, its powerful dual dynamic prevents it from being a pure laugh fest. If you like the film, DO read the book. It’s a quick (in some ways juicier) read and, as many know, has a more fitting ending. Music: Alex North did ‘Who’s Afraid of Virginia Woolf?’ years later. There’s a certain resonance from his terrific work here. Best shot: deep-focus of Rhoda in shadow throwing shoes into incinerator while mom is beyond, under the pure light of an overhead lamp.